At a whopping 19-tracks, this was quite a lot for myself (a non-Marilyn Manson fan) to take in back in 2000. 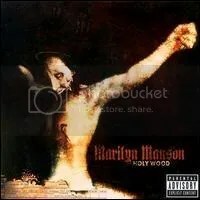 Back in the glory days of Napster, I had “Disposable Teens” and “The Fight Song” on my computer and played’em constantly, so I gave this album a shot, even though I never had any interest in Marilyn Manson before. As a whole, it’s not really my cup of tea. Music like this never was and I don’t care for the imagery that the man himself projects (“Look at me, look at me! Condemn me so I can condemn you!”), but hey, I was young and I actually experimented with different types of music at this time in my life. “The Fight Song” and “Disposable Teens” are still classics that define a certain time of my life and I remember seeing the videos on that trash show, MTV’s TRL back in the day.